Despite making up over half the population of the United States, women only make up 40 percent of alpine skiers and only 32 percent of snowboarders according to participation data from SnowSports Industries America (SIA). Today, Vail Resorts, the world’s leading mountain resort operator, announced a new company initiative to increase women’s participation in skiing and snowboarding. Over the course of the 2013-14 ski season, Vail Resorts conducted research with female guests, at resorts and online, to better understand the barriers to the ski experience for women. Common themes included being overwhelmed by the process and having their hands full managing the experience for the other members of their group/family. “A ski class where I felt comfortable would affect my decision a ton. I’d be pumped to learn with others like me,” said a woman from Menomonee Falls, Wis. The women also commented on their desire to either have ski lessons that better accommodated getting their children into their lessons, or lessons which included their children. 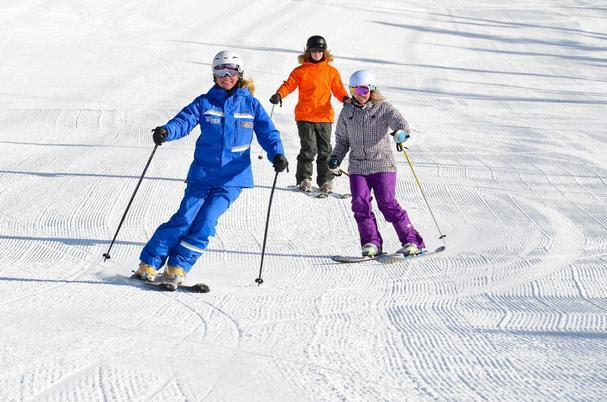 “It would be nice if there were two offerings to fit all women’s situations – jump into a lesson that started as soon as the slopes open OR select a lesson that started around 9:30 or 10:00 so you could get the kids on their way,” said a Stillwell, Kan., mother of four. “I want to spend time with my kids, it’s the primary reason we choose to go on vacations,” said a Palm Bay, Fla., mother of three. The other common theme, specifically from the international participants, was the desire to have someone who could plan the vacation for them and act as an in-resort “concierge,” setting up all the details the women either didn’t know about or didn’t have time to address. These comments led the Vail Resorts to create a number of new programs and products, available for the 2014-15 winter ski and ride season. Vail Resorts’ Ski & Ride Schools will offer the Women’s Ultimate 4, a lesson for women where they can join fellow women and a female coach to learn or brush up on skiing in a small-group setting, from the foundation-building basics of a “first-timer” class (open to all), to navigating the easiest greens, to sharing tactics and camaraderie on mountain green and blue runs. Women’s Ultimate 4 lessons will be offered at Vail, Beaver Creek, Breckenridge and Keystone in Colorado, Park City and Canyons in Utah, and Heavenly, Northstar and Kirkwood at Lake Tahoe. Select resort Ski & Ride Schools will also offer four-hour lessons for women, providing ample time for the drop-off and pick-up times of their kids’ lessons, as well as “Mommy & Me” lessons, where instructors spend time with the mother and the child, reviewing what the child is working on and providing tips on how to continue to develop the child’s skills. The comments also spurred Vail Resorts to create Prima, a personalized concierge service to assist with every aspect of the vacation experience for the company’s most loyal Brazilian guests of Vail and Beaver Creek.